Philippine Airline Promo: It will be a long day and we will have more sun exposure because it's now the start of SUMMER! Yes, March is here and we can now feel the summer heat. More or less, a lot of us now plans for a summer vacation or staycation, perhaps! But it's nice to really travel and visit some tourist destination that we have never been to! And of course, we should consider stuffs to bring or our travel essentials. We have come up with a list of top 10 picks we thought would be essential for us to bring when we travel. And we believe you could also do the same. Even though our main goal in having a vacation is to relax, it's also good that we prepare for it. Cause anything can happen during traveling. Let's not get ready for summer 2017! This Phil Airlines blog is happy to create a list for you! A big bag- You definitely need a good bag with big space to fill in your travel essentials. That's a no-brainer. Pair of Sunglasses - It's all about eye protection when we wear a pair of shades. And of course for a better flirting tip as well. Huge Hat - Wear a hat that is big enough to provide shade for your entire face. Maybe choose something that is fancy and of summer feel! Camera Phone - It's nice if you can keep photos about your trip. We are highly social people and we also want to keep memoirs of the events in our life when we travel. And it's basic to have it nowadays so people could contact you. Selfie Stick - We believe this is essential for a millennial. Those who loves to take selfies and upload them on their different social media accounts. And if you are traveling solo, a selfie stick is really a helpful tool for you to bring. Pair of Slippers - Be comfortable. You will spend more time walking at the beach shores. So be in your slippers. Loose Shirt - At least bring something comfy and light. An extra shirt is highly recommended. You might be experiencing excessive sweating due to the summer heat. Bikinis or Board Shorts - Well, wear appropriate outfit at the beach! Time to bring out those hot bikinis and colorful board shorts for men and flaunt your way! Water - Make sure you have a bottle of water with you. Water up, darlings! You have to quench your thirst! Hydrate if possible! Sunscreen Skin Protection Lotion - Apply some sunscreens when you go out under the sun! Look for something with a high SPF like 60. Give your skin some love! And don't over expose yourself too! We have an idea now on what to bring in one of your trips or vacation this summer! Feel free to share it as well with your friends and family. Oops, have you booked your tickets? 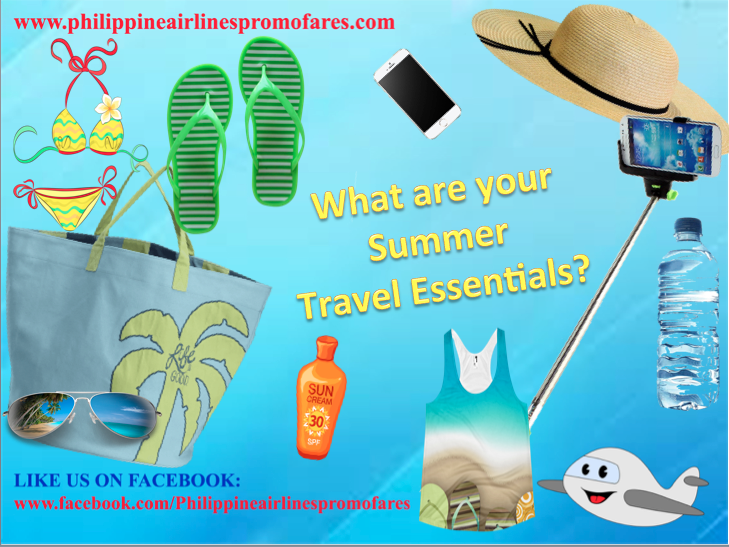 Make sure to check this website for Philippine Airlines Promo fare.